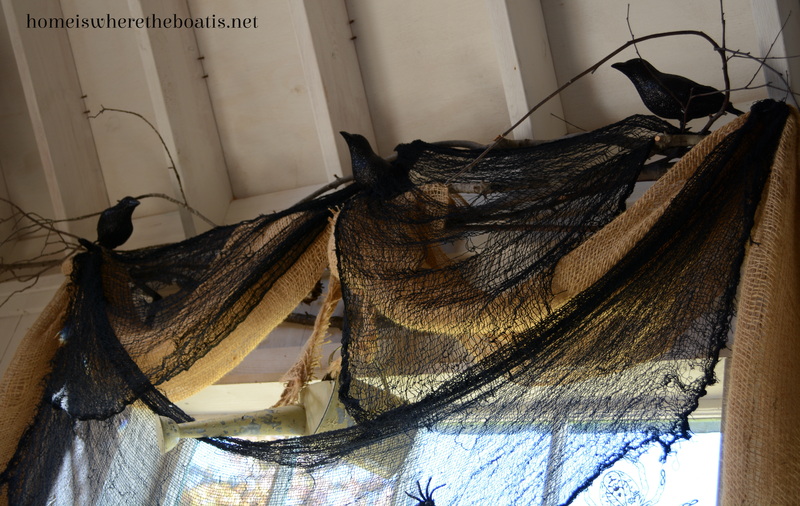 I have a Haunted Tableau and final Halloween post for you. 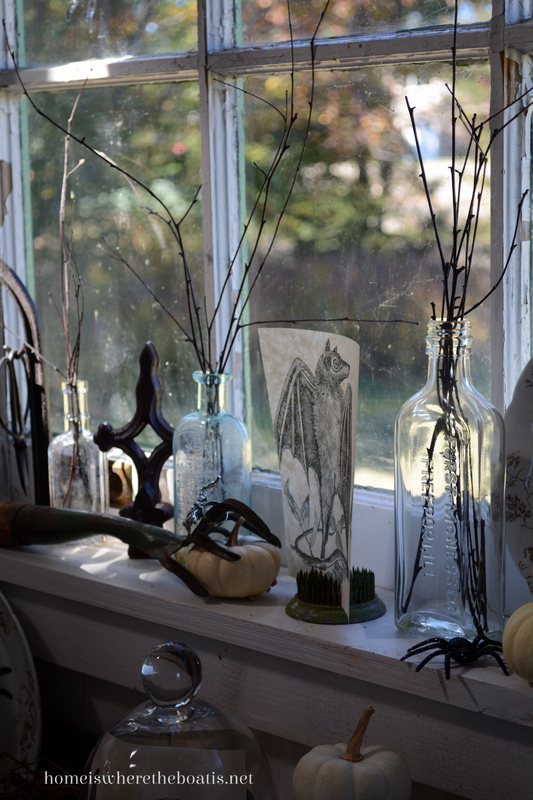 . .
Set in my Haunted Potting Shed. . .
covered with a creepy fabric. 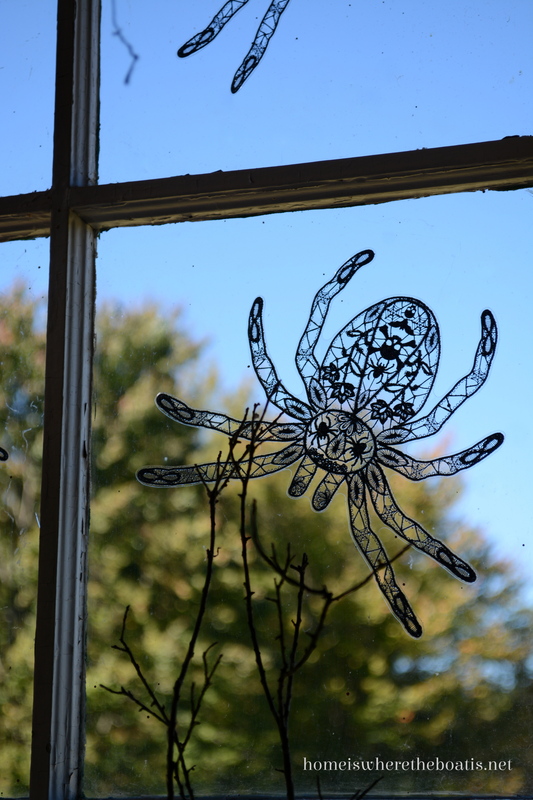 . .
Martha Stewart Crafts Gothic Lace Window Clings. 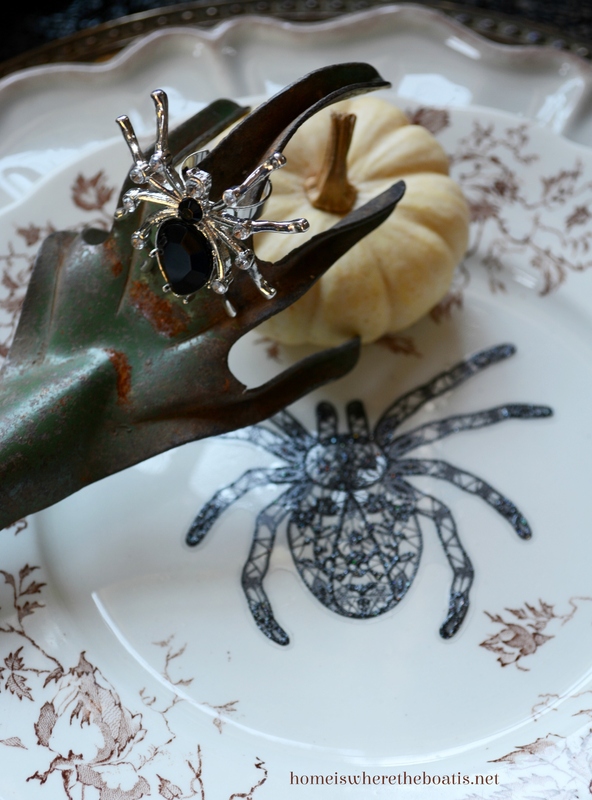 and also transferware plates for a little spooky fun. 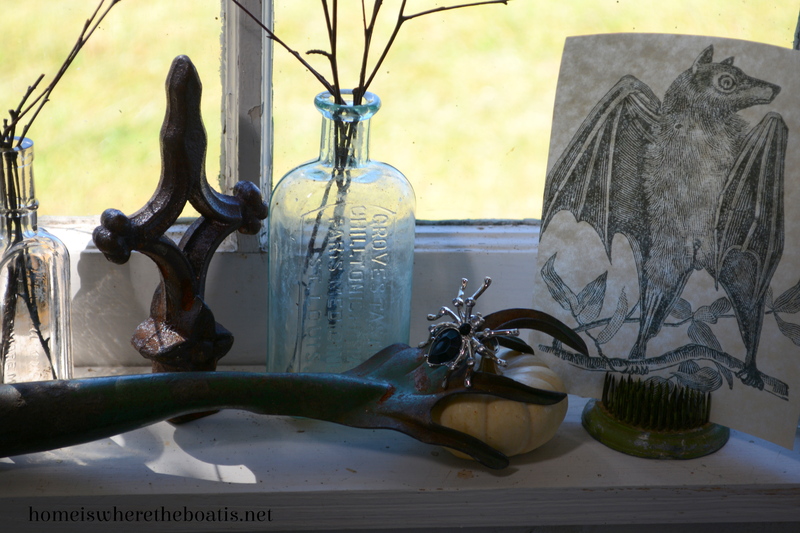 Potion bottles line the window ledge. 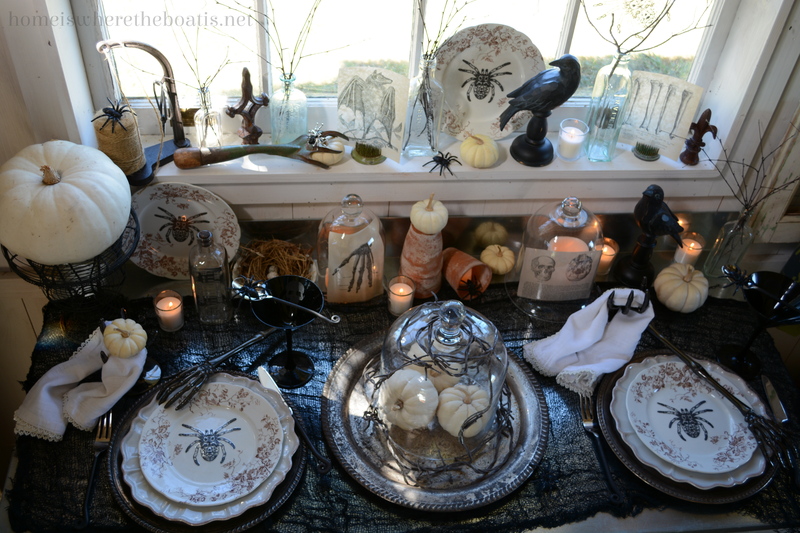 . .
And dreadful images of bones, skulls and bats join the Haunted Tableau. and proceed with caution. . .
waiting to serve your potion or poison. 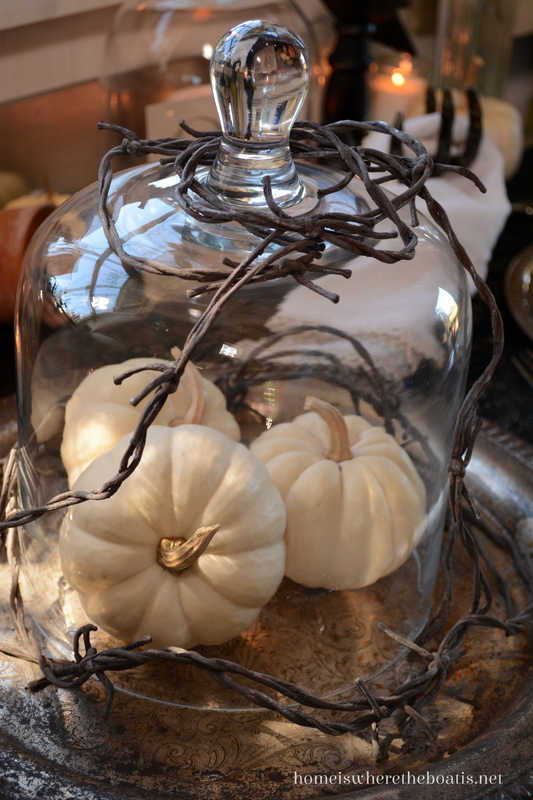 . .
with barbed wire for Cloche Encounters. in their evil clutches, and are offering napkins to use, if you dare. . .
can appear a little creepy and spooky . . .
And when a garden fork can appear as a sinister hand. . .
EVERYTHING you do is AWESOME!!!! I smile when I see you have a new post! Thank you !!!! BOOO🎃👻 thanks for sharing! 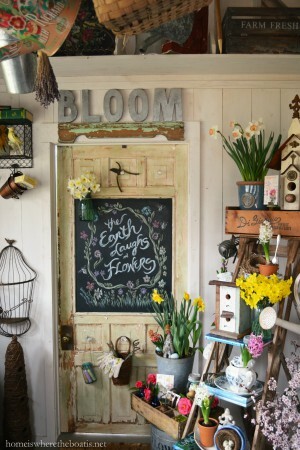 Your lucky to have such a nice potting shed and for being so creative! 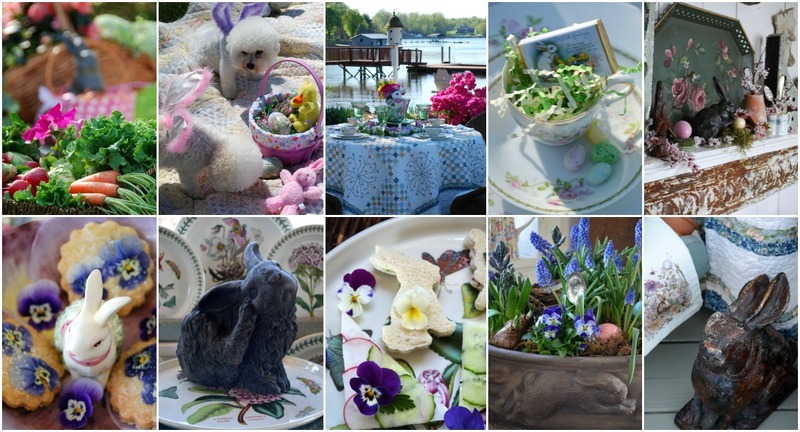 The potting shed is always fabulous! Love the link to the Graphics Fairy. Every thing you do is so creative, and really original. Look forward to your posts. Can’t wait to see Thanksgiving and Christmas, although I don’t really want to rush things. Playing in your potting shed is so much fun, Mary! 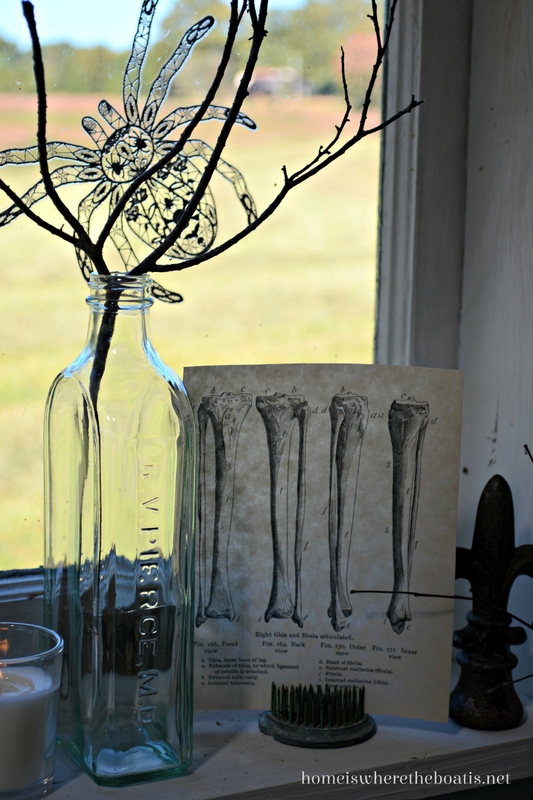 I love seeing what you have conjured up with your crafty spells! Those clingy decals and creepy fabric add such character to change the look. Happy Halloween to you and thanks for all your creativity. What creepy fun this is!!! 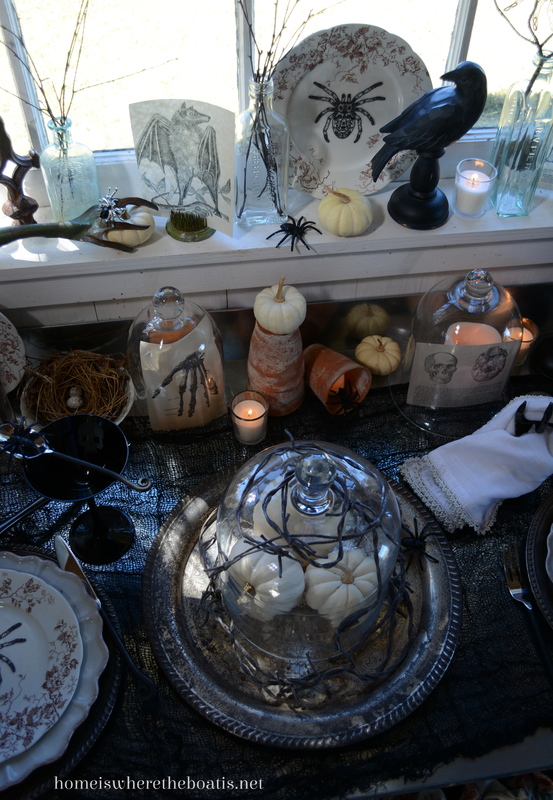 My pst this morning is a Hauntingly Witchy Table for Halloween! Your creativity is boundless. Love the clings, have to get some . Have a Happy Halloween. Happy Halloween! Love your potting shed- such fun. Yikes! Enter if you dare! This is totally creepy Mary, that garden fork hand with the ring would send me running out the door! Looking at all the spiders clinging everywhere literally made my skin crawl!! Super Spooky in black and white~ I sure am going to miss all the Halloween fun~ The ghosts and goblins won’t dare show up at your shed! Mary, you have so much fun in your potting shed, don’t you? And luckily, we can join in! 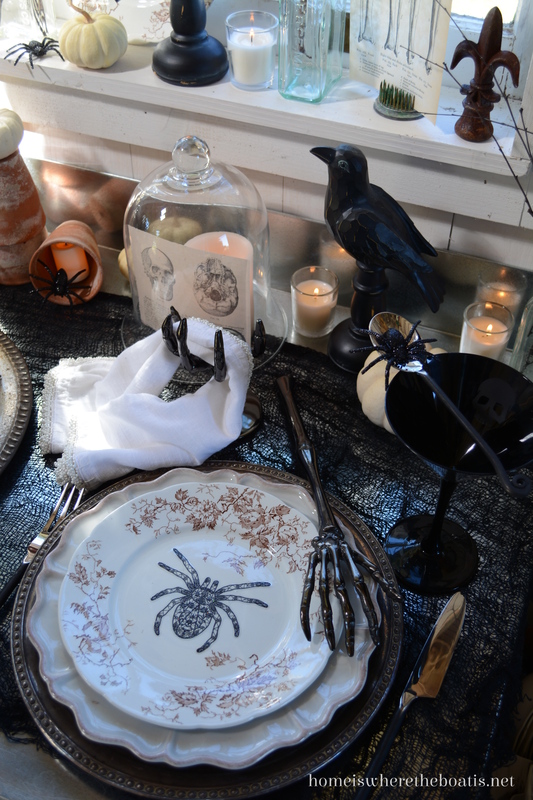 Those lace spider clings are beautiful in a creepy kind of way! And I love how you’ve put your vintage flower frogs to work! You are one amazingly talented lady! My kind of fun! Love the details. The Martha Stewart clingy pieces are really neat! 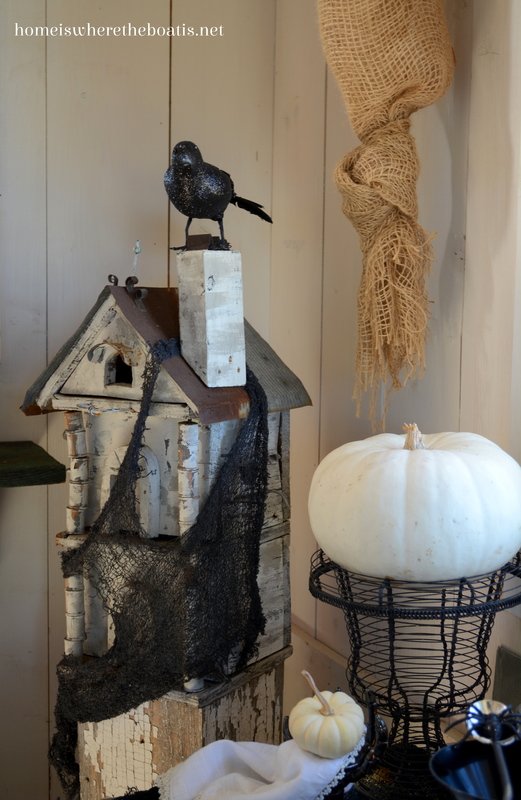 I loved your creepy little potting shed, first you see the elegance and then you notice the creepiness! haha! 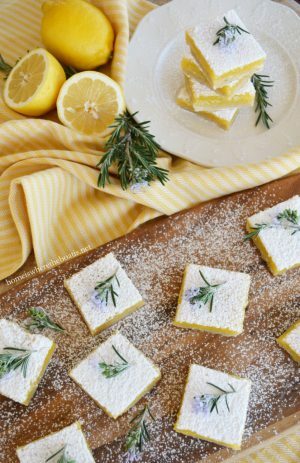 Your posts are always so lovely and inspiring; if only I had your resources! I really love the garden fork as a hand with the spider ring! I am not really decorating for Halloween this year, but I do have a wreath on the door, which I’ve used for the past couple of years. I really like it, and although I don’t have a picture, I wanted to share it with you. It is a straw wreath with a “silk” spider plant (see what I did there?) wired on to it. I sprayed painted it with black spray – very splotchy paint application – and hot glued an assortment of rubber spiders all over it. I also really like the MS window clings and that you put them on the dinnerware. Happy Spookings. Just when I think you can’t do anything more fun…you do! You are so amazing and creative. I always enjoy seeing your posts! ps love your pups! 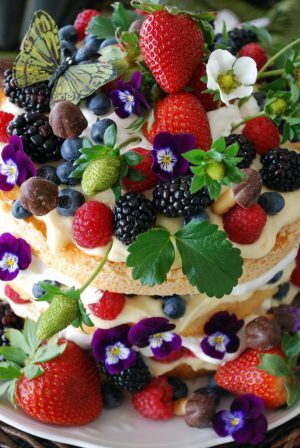 I am always delighted and inspired when I see your posts…what an artistic imagination. For example: using the faux barbed wire just makes the piece “pop”. I look forward to all your posts. Happy Halloween! It’s not only your imagination and creativity, all of your wonderful ideas and props (clever using rusty barb wire around the glass cloche) and stunning photography, but your clever captions ‘capture’ the perfect mood! I’ve signed up but I’m not receiving emails from you. What’s up? Hi Denise, Check your spam folder to see if post notifications are there. 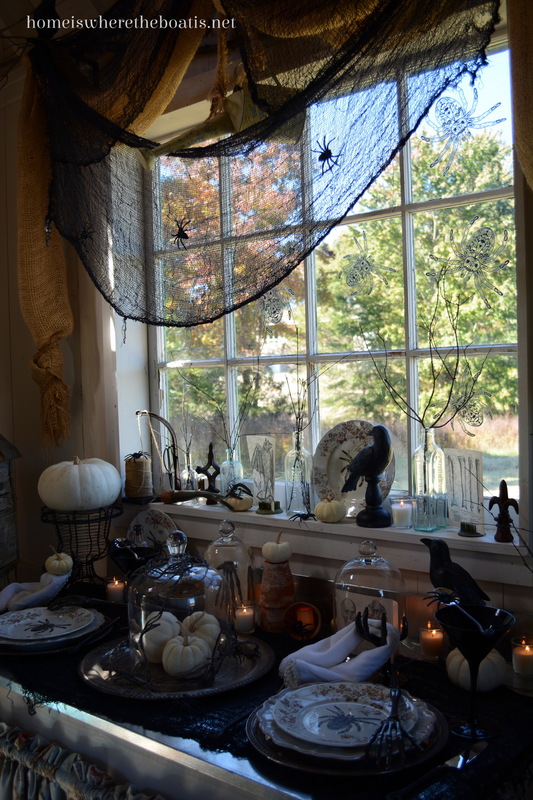 Your creative mind always astounds me!…I think you could even scare the goblins away….enjoyed every nook and cranny of this ever so beautifully creepy shed…. OMGoodness!! 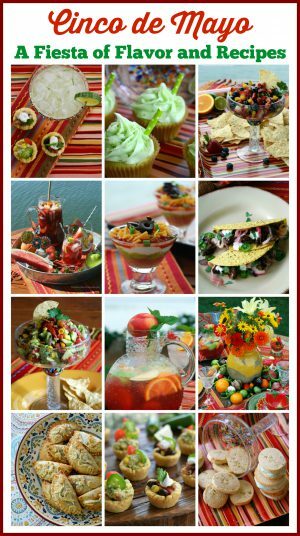 so much here to drool over! 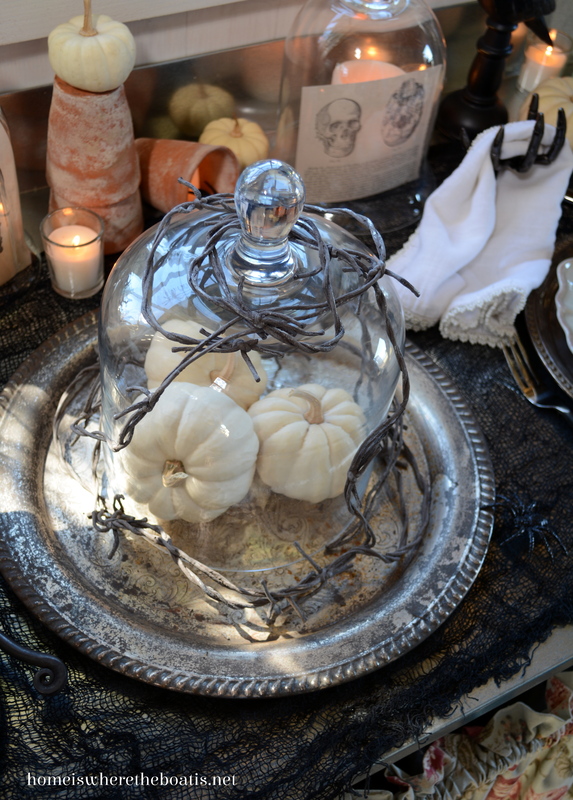 I think my two favorites are the spider ring on the hand and the barbed wire on the cloche!! 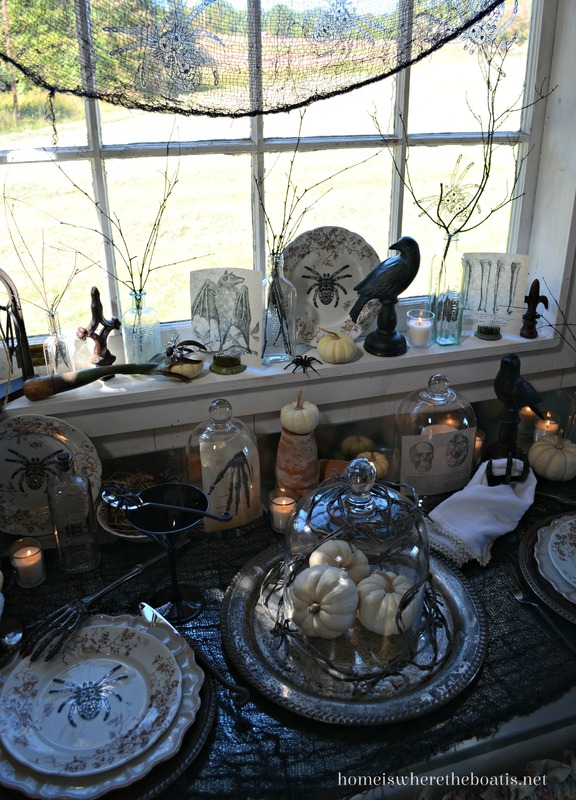 So now you have me wanting to drop everything I should get done today to set a Halloween table!! Love it! I still love this! Just as fun the 2nd time around! When you built your potting shed, who knew it would be the site for so much creative inspiration! 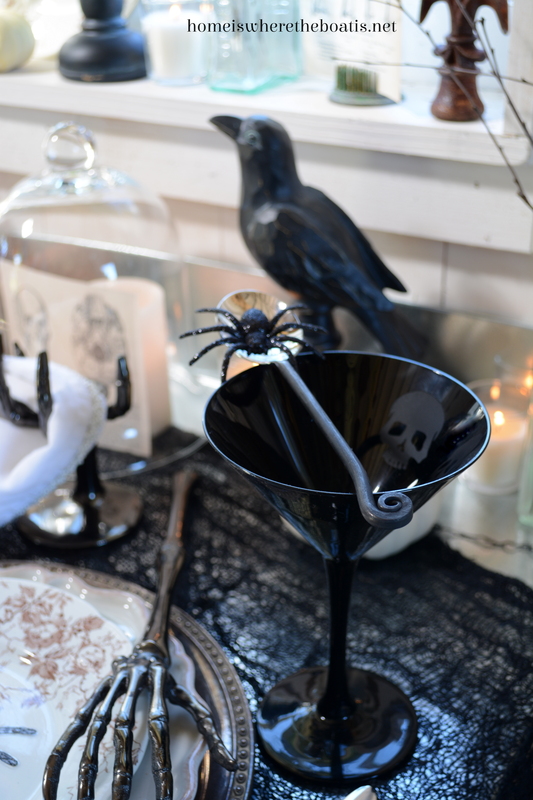 This is a perfect mix of spooky and classy! 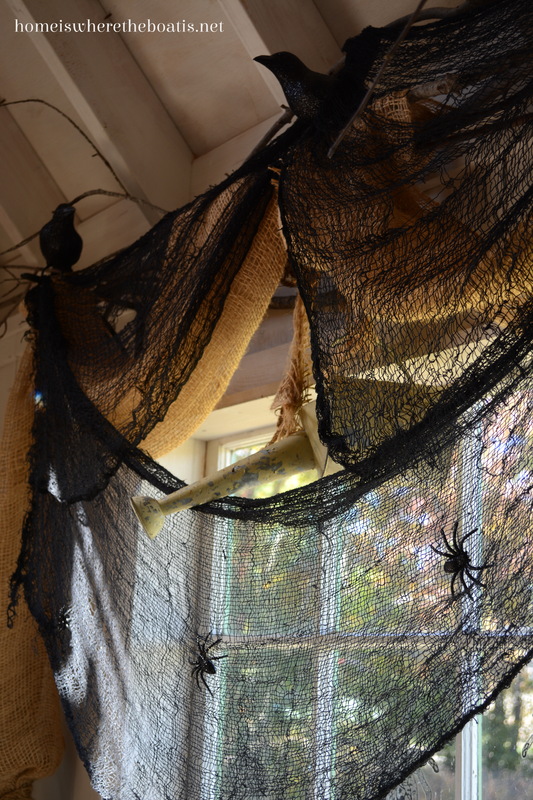 Your potting shed is decked out for Halloween! 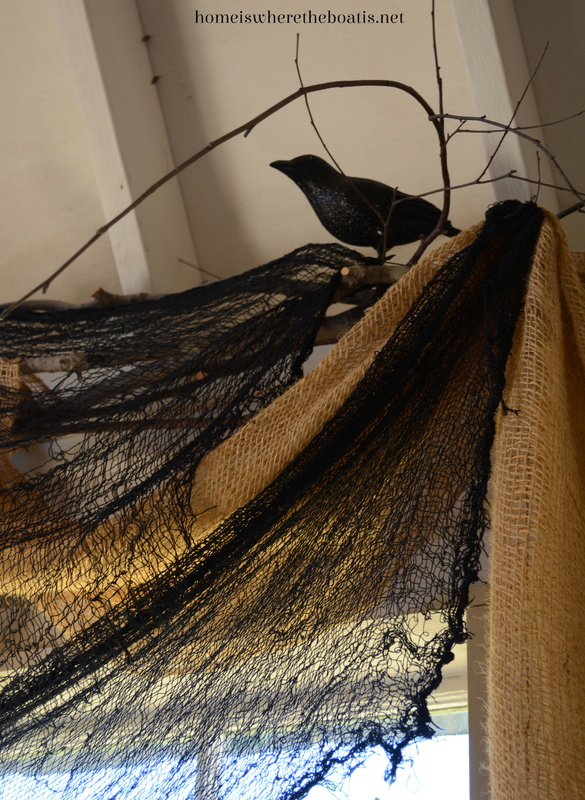 The ravens, spiders and bugs are so creepy in a good way. 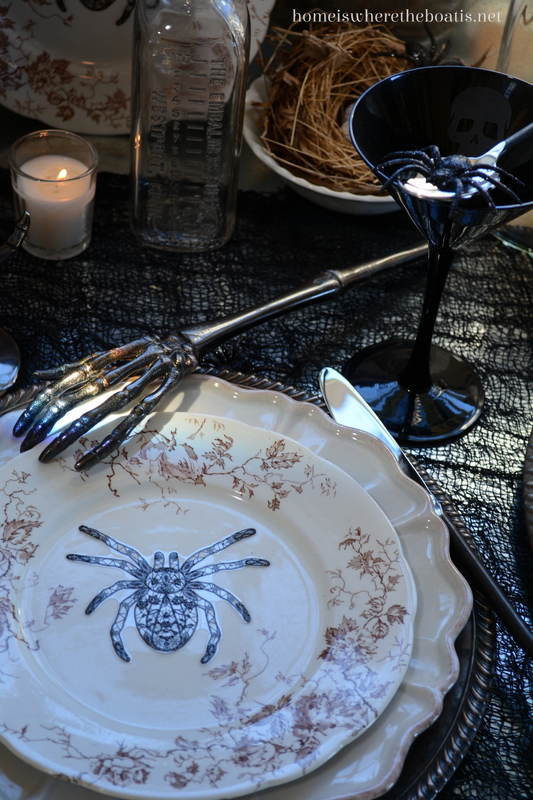 The antique plates with the spider clings are so clever. 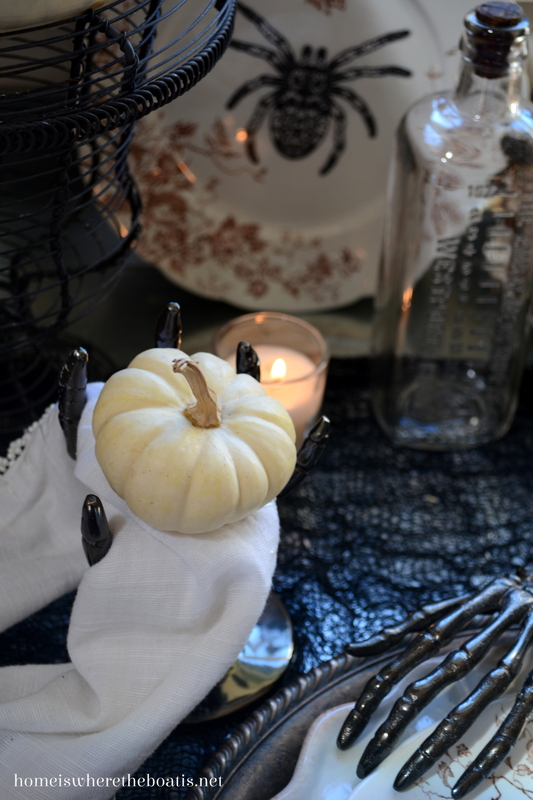 Please, pop over and view my Halloween post this week! 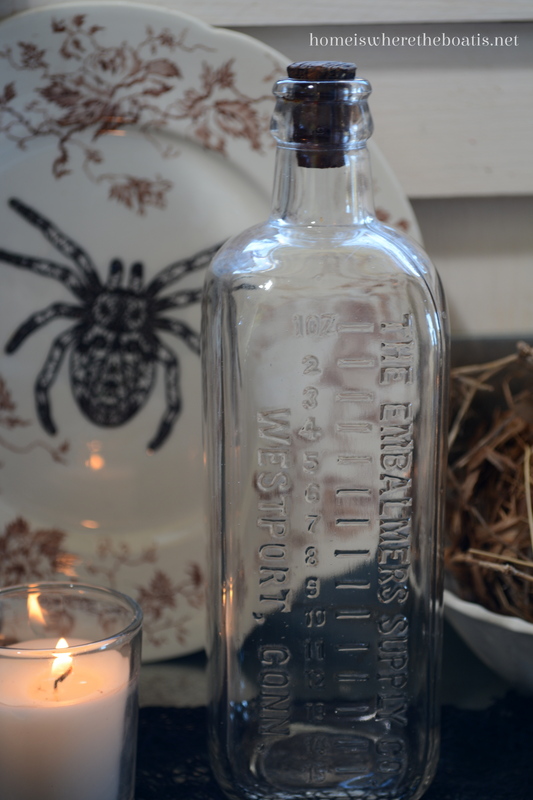 So charming…love your spooky transfereware!